Which Oscar races do you expect to be most hotly contested? It has to be Best Actor and Best Actress. It's practically a toss-up between the top two in each category. For Best Actor, Mickey Rourke is the favorite at 6 to 5, while Sean Penn is the second choice at 7 to 5. The other three: Frank Langella at 6 to 1, Brad Pitt at 15 to 1, and Richard Jenkins at 40 to 1. For Best Actress, Kate Winslet is the favorite at 8 to 5, while I've got Meryl Streep at 9 to 5. The other three in that category are Anne Hathaway at 6 to 1, Angelina Jolie at 8 to 1 and Melissa Leo at 12 to 1. I would be surprised if either category has an upset, but I won't be shocked. I hang sports lines  upsets happen every single day. I don't consider that race to be close. Slumdog Millionaire is at even money, with The Curious Case of Benjamin Button at 7 to 2, Frost/Nixon at 5 to 1, Milk at 10 to 1 and The Reader at 15 to 1. If there's an upset in this category, I think it will come from deeper in the stack  not from Benjamin Button, but perhaps from Milk. 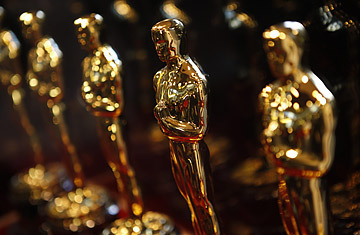 What other odds will you offer for this year's Oscars? We always offer what are called "proposition," or "prop," bets. This year, I took the total number of nominations for each movie and set a number for how many total Oscars the movie will win. Bettors choose to go over or under that number. So let's take Benjamin Button. The movie received 13 nominations. I hung the number at 2.5 and think the under is the favorite, meaning I don't think that movie will win any more than two Oscars overall. Another fun prop bet is the number of viewers that will be watching; this year, I hung that number at 36 million. Almost 29 million people watched in 2006, and 40 million watched in 2007, but only 32 watched last year. In an economy like this, I think more people will be watching this year. If I were betting, I'd take the over. Can people wager real money on these odds? No  the odds are for entertainment purposes only. The Nevada Gaming Control Board only allows us to take wagers on sporting events played in an arena. We still try to treat these odds like any others: we put them up on the big light board here in the sports book and print them out on sheets for customers to take home. What sort of information do you consider when hanging Oscar lines? The process is pretty involved. I start in November by talking to people that I know in the movie industry. I get feedback from them about what's out there and what's coming up. Then, in December, I try to see which films ordinary people are talking about. Through the Oscar nominations and other awards shows, I adjust my expectations. Finally, before I hang my odds, I talk to some regular people who work here at Wynn. They go to the movies and share their input. They are consumers, just like everybody else, and their opinions are important. How long have you been offering entertainment odds? It goes way back. I've been doing the Oscars for 15 years, and started offering odds on reality television shows with the first Survivor back in 2000. Now I do American Idol and Dancing With the Stars. I also give odds for the Westminster Kennel Club dog show and the Nathan's Famous Fourth of July International Hot Dog Eating Contest. A few years ago, I even hung odds on who was the Carver in that F/X show Nip/Tuck. That was a fun one. I'd like to say I'll be at the Oscars, but I've never gotten an invitation. Instead, my wife and I will invite people over to our house for a party. We'll have a red carpet for our guests when they walk through the front door. Inside, we do food and drinks in the family room, where we all gather to watch the show. When you walk your own red carpet, what will you be wearing? Not a famous designer, that's for sure. I dress up every single day for work in a suit, and when I'm not here I try to dress as comfortable as possible. I'll probably wear sneakers and jeans. I may even have a T-shirt on that night. Ed Hardy is about as fancy as I'll get.